March of Dimes is an organization that aids in the fight against premature babies and helps educate pregnant mothers and their families how to have a healthy pregnancy. In order to support their cause, March of Dimes produces one of the best culinary events of the year called Signature Chefs. For the last 12 years, some of the best chefs in Las Vegas have come together to create a night of the best eating in town. Luciano Pellegrini serves his dish: Lobster Carbonara. The entire group of participating chefs gathered for our applause. I was lucky enough to have attended last year’s Signature Chefs, and it was an extraordinary evening! The night began with a silent auction full of beautiful paintings and artwork, gourmet group dinners at select Las Vegas restaurants and weekend spa packages. Once the silent auction ended, we were escorted into another room filled with elegantly decorated tables surrounded by tasting stations. Each chef created a dish of their choice: from little samples of a favorite entree, to old-fashioned desserts, to brand-new dishes that a chef was experimenting with – there was a incredible variety of flavors, fusions and concepts offered at each table. Each dish was exquisite – they were like little works of “food art”. One of my favorite parts of the event was that the chefs not only created the cuisine, but they also participated in serving it to their guests. It was amazing to be able to meet and shake hands with each chef, while they closely watched our faces as we sampled their food. This was a wonderful way for me to get personal with the biggest “foodies” in town! The evening ended with a live auction (that was a lot of fun!) and a short presentation. It told the story of a little boy who was born extremely premature to a Las Vegas family and, thanks to support from March of Dimes, grew into a healthy six-year-old. The little boy was there, and proudly took the stage at the end of the presentation. There was a roar of applause for him, and it was a perfect end to an incredible night. From scallops to cheesecake...there was something for everyone. Not only did my husband and I leave Signature Chefs with full, extremely satisfied bellies but, we left inspired. We went home with delicious food on our taste buds and our hearts filled with love. 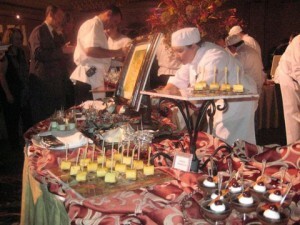 Caesar’s Palace hosts this year’s Signature Chefs on October 3rd, 2009. Proceeds benefit March of Dimes and support for perinatal education and programs to educate families for healthier babies. The theme is “Latin Nights” (I wonder if the food will also reflect this?) and it’s hosted by Caesar’s Executive Chef, Eric Damidot. 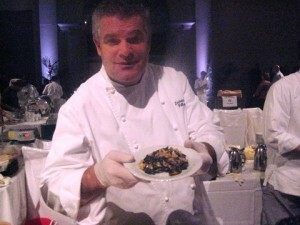 For a list of all the participating chefs, visit the March of Dimes Signature Chef’s page. Tickets to the event are still available, and can be purchased through the March of Dimes’, Nevada chapter, website. I look forward to this year’s best culinary party. 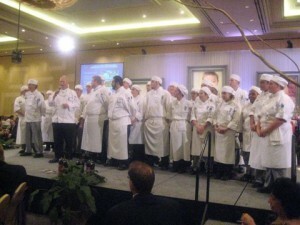 Stay tuned to Living-Las-Vegas for a full report on the March of Dimes’ Signature Chefs, 2009! I can’t wait to hear how this event goes. My mouth is watering just thinking about it.